Whatever the weaknesses of the 13th Amendment or devolution in the present constitution, there is a clear socio-economic philosophy behind it, for the benefit of the people living in the provinces. That is the objective of ‘balanced regional development’ which can hardly be achieved under a complete unitary state. This is something which needs to be carried forward and strengthened in a new constitution. It is generally accepted that ‘uneven development’ is one underlying reason for many of the ethnic and other social conflicts in the world. This is similar to the thesis put forward by Tom Nairn in his ‘Break-up of Britain’ in 1977. Youth unrest, rebellions and thereafter armed struggles developed both in the South and in the North primarily in the country’s poor and underdeveloped provinces. The acceptance of this fact is not about economic determinism or rejection of other political factors such as the dreadful ethnic discrimination/suppression in the case of the civil war in the North/East, but placing those conflicts in a broader socio-economic background. Sri Lanka’s constitution making is perennially weak in conceptualizing the principles behind institutions, structures, authorities and resultant powers in the governing system. They are mostly dry and boring legal documents. If they refer to concepts at all, they are mostly abstract in nature or repetition of what appears in text books (e.g. people’s sovereignty). The 13th Amendment is also the same in most of its formulations. However, there are some gems among the stones. ‘Balanced regional development’ undoubtedly is one of those gems. Although the ‘balanced regional development’ is tagged to the Finance Commission (FC) in the 13th Amendment, its objective can be considered one of the main pillars of devolution in general. 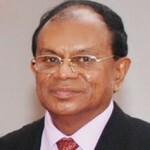 It is not clear whether the provincial councils or the central government ever took this objective into proper account. It was always relegated to the FC and considered just as a formula for financial allocation, yet within the strictures of the Treasury. What the Article 154 (R) (5) says on ‘balanced regional development’ is the following. The above is the present (legal) status. Even in the future, it might be advisable to have a truly independent commission to assist the provincial councils and even the central government in formulating ‘such principles with the objective of achieving balanced regional development’ not only among provinces but also within. There is such a commission in South Africa called the ‘Finance and Fiscal Commission.’ In the case of Sri Lanka, it might be better to call it the ‘Finance and Planning Commission’ as there are major planning matters to be sorted out apart from finance and fiscal matters. However, ‘balanced regional development’ is primarily a task for the provincial councils and the central government in mutual cooperation, and not for the FC in isolation. The best model for Sri Lanka in this case is ‘cooperative devolution.’ When you take the population of each province, per capita income, socio-economic disparities, and the ‘difference between the per capita income of each province and the highest per capita income among the provinces,’ the massive uneven development in Sri Lanka is very clear. What is missing in this inventory might be the ‘disparities in natural resources and environmental conditions.’ These also have to be taken into account in trying to ameliorate uneven development in the country. ‘Uneven development’ largely is a product of colonialism and lopsided capitalist development. It is not clear whether the pre-colonial situation was even or balanced. Perhaps not. However, we have more accurate information since the colonial period. It is mainly the Western province that became ‘developed’ under (British) colonialism and the unitary state. The unitary state, and politics controlled from Colombo, contributed to this debacle. Even though major surpluses were extracted from the tea plantations, the central province remained underdeveloped as the benefits were not distributed to that province or the people. This was underdevelopment within underdevelopment. In the provinces, although major towns such as Jaffna, Gale, Trincomalee, Nuwara Eliya or Kandy were developed, the purpose was mainly administrative and not socio-economic. This is the trend which has to be reversed, and one of the main ways that could be done is through devolution. Take the one time popular saying in the south, ‘kolombata kiri apata kakiri,’ literally meaning ‘milk for Colombo and melon for us’ or ‘everything for Colombo and nothing for us.’ There is an undeniable truism in this saying even today. There has been a very clear ‘centre-periphery dichotomy’ in Sri Lanka both in the economy, and in the socio-political sphere since independence, the Western province dominating. This dichotomy became overwhelming under the open economy after 1977. Let me give some empirical evidence in the following Table (GDP Share by Province, 1990-2015) for the last 25 years. According to these figures, the Western province still remains dominant in the economy (41.2), but since the end of the war, some course correction is underway. 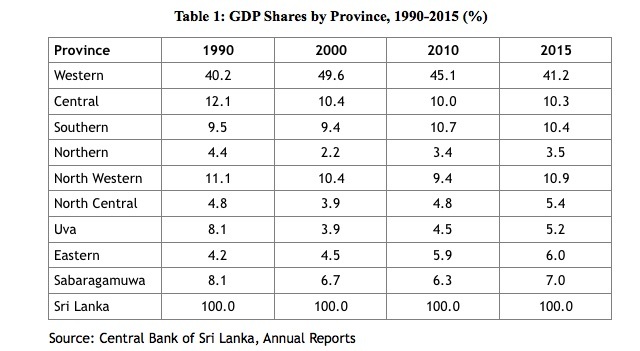 The GDP share of the province was 40.2 in 1990, but increased during the war, peaking in 2000-2005 period. The figure for 2005 was 50.8 percent. The Eastern province, traditionally called the ‘granary of the country,’ once contributed 14 percent, but declined under the open economy and then the war. ‘Open economy’ is a policy that Sri Lanka cannot avoid, but to counter the adverse effects, a ‘balanced regional development’ is necessary. By 2015, only the Central, the Southern and the North Western provinces could achieve a 10 percent contribution. Among the other provinces, while the North Central (5.4), Uva (5.2), Eastern (6.0) and Sabaragamuva (7.0) struggling above the 5 percent mark, the Northern province is still lagging behind around 3.5 percent, even after the end of the war. Uneven development and regional underdevelopment not only highlight the need for devolution, but emphasises the requirement for rethinking as to the way it should proceed in the future. The argument here is not about having equal share of GDP for all provinces. This is unthinkable given the provincial disparities in population among other factors. The population share of the Western province for example is around 29 percent, and it is natural therefore for that province to achieve a higher share of the GDP also given the fact that physical capital (i.e. infrastructure) and the human capital (i.e. education, health) are comparatively higher. 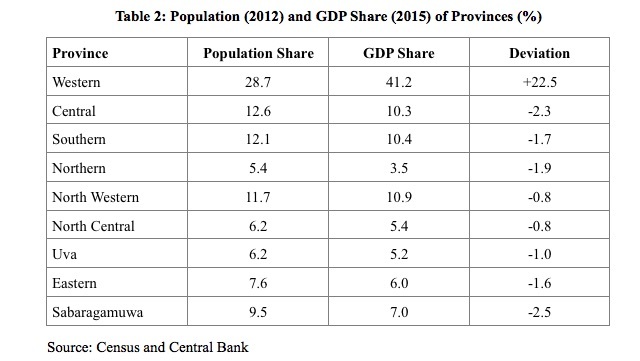 The following Table 2 gives a comparative picture of the population share (2012) and the GDP share (2015) for the provinces. It is obvious that a province like the North Central or Uva might not achieve a share like the Western. The population shares are different. This applies to the other provinces, and also to the North and the East. However, given the vast areas of land in all these provinces what they can achieve in agricultural production might be immense, if the agriculture is modernized (largely physical capital) and the agricultural labour is better skilled (human capital). It is also too obvious that financial capital does not flow, internal or external (FDI), unless there are sufficient base for physical and particularly human capital in the provinces. Considering that difference in physical and human capital is the main reasons for uneven share of GDP among different provinces, a major task for devolution would be to bridge these disparities. While reliable data are not available for a proper comparisons, some of these disparities are also visible. When you travel from Colombo to the North (North Central included), East, Uva or the deep-South, you come across underdevelopment, poverty and poor infrastructure facilities. What you might not see visibly are the social or human development conditions. These are the poor conditions particularly in health and education and also gender inequalities. ‘Sri Lanka Human Development Report 2012’ (UNDP) gives a valuable comparison from pages 15 to 19. According to these information, calculated primarily on the district basis, Gampaha, Kalutara and Colombo, stands the highest in that order in the human development index (HDI), while the Northern Province is the lowest as a province. As districts outside the Northern Province, Nuwara Eliya, Batticaloa and Badulla stand the lowest in HDI. As these information also show, the disparities are not only between provinces, but also within provinces, both at the district and divisional levels. That is one reason why the devolution has to go deeper, and into the divisional or local government levels. There are some welcome developments when the year 2015 is compared with 2014. This however should not be exaggerated considering the progress that needs to be achieved in the future. As the Central Bank reported, the share of the GDP of other provinces (other than the Western) increased from 58.3 in 2014 to 58.8 percent in 2015. All these provinces performed better in 2015 except Uva recording a decline. The Eastern province doubled its growth rate while the North achieving a 12.1 percent growth rate. Both provinces were rising from a lower base, and the growth was in agriculture and not in industries or services. There are obvious two extremes to be avoided if balanced regional development needs to be achieved in the country through devolution. One is the ‘unitary’ thinking where the dominant politicians and the bureaucrats believe that regional development can be achieved or projected from Colombo. This can and have happened even under devolution. The other is the emotional political demands or ‘separatist’ thinking of many minority politicians neglecting the socio-economic factors of the issues involved. Both are self-serving devices on the part of the elitist politicians. Sri Lanka has experimented both, but has failed miserably. 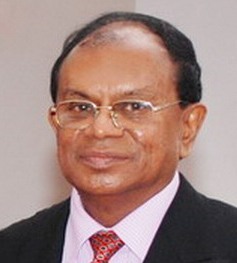 While the initial national economic plans, first the ten year (1956-65) and then the five year (1970-75), geared from Colombo failed to achieve balanced regional development, the ‘bull in a china shop’ approach of the open economy (since 1977) had been a colossal disaster in this respect. The present predicament is that both the ‘unitary’ thinking and ‘separatism’ still dominate the devolution debate as well as its crooked practices. One consequence is the vast disparities in income distribution throughout the country. According to the available figures, the poorest 20 percent of the population receives only 4.5 percent of total household income, while the richest 20 percent receiving 54.1 percent, although the absolute poverty is now comparatively low. What might be necessary in achieving such a ‘balanced regional development’ obviously is ‘cooperative devolution.’ It is also clear that if such an objective is accepted in a new constitution, more research needs to be done particularly in assessing the existing levels of ‘physical and human capital’ and also quantifiable ‘natural and environmental conditions’ in and between provinces.